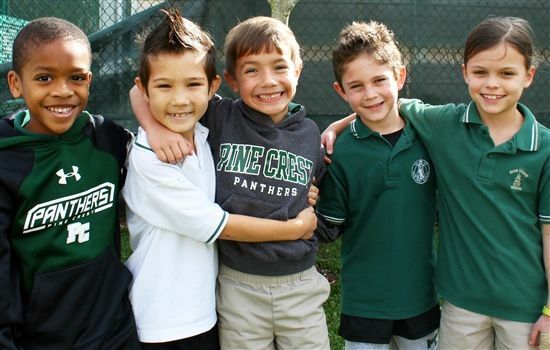 Pine Crest School's exceptional Lower School program provides an experience rich in opportunities for social, emotional, physical, and academic growth for our students. Our teachers are trained to engage students with brain-based learning strategies that foster their academic, social, emotional, and physical development. In grades one, two, and three, each state-of-the-art classroom is nurtured by two full-time teachers who engender a love of learning and thinking in all students. Each fourth and fifth grade classroom is led by one full-time teacher with three full-time teachers rotating throughout the classrooms to support homeroom teachers and students. The Pine Crest Lower School curriculum incorporates skills such as critical thinking, creativity, collaboration, technology, and communication. Our Lower School students are exposed to information and activities that stimulate curiosity and excite the imagination, while encouraging them to become independent thinkers, intrepid problem solvers, and leaders prepared to meet global challenges of today and the future. The curriculum provides each child with strong foundational skills in literacy, mathematics, computer science, science, social studies, world languages, leadership, technology, and the arts. Our academic programs are thoughtfully designed and implemented based on the developmental needs of our students and supported by research-based teaching strategies. For this reason, we are able to offer exceptional programs that support our school mission. Lower School Reading and Writing Workshop is structured to teach reading and writing as an active, student-centered process. Our literacy program is dedicated to fostering a lifelong love of books and reading. Students develop their skills through rich, literature-based activities in reading, writing, listening, and speaking. Our goal is to nurture each student's individual needs, imagination, creativity, and interests while building a strong reading foundation in comprehension, vocabulary development, fluency, and phonemic awareness. Word Study in Lower School integrates spelling, phonics, and vocabulary instruction into one comprehensive program with grammar beginning in first grade. This challenging curriculum component teaches students how to look closely at written language to discover the patterns of spelling rules and generalizations while learning the meaning of words. During Word Study, students are taught to recognize individual sounds and words, letter/sound relationships, and spelling patterns. Students in fifth grade focus on the etymology of words with particular attention on Latin and Greek roots. They are taught to recognize individual sounds and words, letter/sound relationships, and spelling patterns. As word solvers and wordsmiths, students are taught not only how to spell correctly but also to understand how language works. Students learn that there are many word-solving strategies that they can use to spell, to understand the meaning of words, and to make important word-grammar connections. The Lower School computer science curriculum focuses on design, engineering, critical thinking, and maker activities. Students explore computing practices and programming through the use of technology tools. In addition, they learn to use the MIT block programming language Scratch. All Lower School students practice problem decomposition, functions nested in loops and conditionals, transmission and sorting of data, designing and building a digital environment, and modeling or simulating robotic structure and design. In the Lower School, we use the problem solving component of Singapore Math, known as Model Drawing, to support the development of mathematical word problem solving. The approach teaches students to create pictorial representations of known and unknown numbers and supports the development of pre-algebraic thinking. The math curriculum is designed to engage students in making sense of mathematical ideas. The mathematics content is organized and presented in five strands: number sense, algebra, measurement and geometry, data analysis, and mathematical reasoning. The core curriculum is designed to support students' ability to make sense of mathematics and to learn to be mathematical thinkers. The Lower School science curriculum offers students the opportunity to apply scientific and engineering practices to address our local and global challenges. Through investigative labs, students transition from teacher-directed inquiry to more independence, where they plan a test of a hypothesis, make observations, and collect and interpret data. Students focus on inquiry-based learning while mastering the concepts of the scientific method. Students learn how to apply scientific concepts in class to generate testable questions, establish test procedures, collect data, make observations, and analyze and present findings. The Lower School social studies curriculum focuses on collaboration and cross-curricular integration activities to encourage students to discuss social studies topics. Our interdisciplinary approach provides students with the opportunity to make connections between what they are learning in class and the world around them. Our students are given opportunities to ask and investigate authentic questions about historical and current events so they can become independent thinkers and problem solvers. Another aspect of the curriculum includes teaching students to recognize their roles as citizens in their local and global communities. Students learn about American history, geography, economics, civics, and government with a focus on leadership, tolerance, and respect. The Lower School introduces students to the Spanish language and the many cultures that use Spanish to communicate. We believe communicating in another language promotes empathy and understanding, and is an important element in the development of Pine Crest students as global citizens. Our curriculum focuses on the Standards for Foreign Language Learning: communication, cultures, connections, comparisons, and communities. In a Lower School art class, young artists learn about color theory, elements and principles of design, art history, painting, sculpture, ceramics, drawing, design, fibers, printmaking, and contemporary art making. Students are introduced to Digital Media Production in grade five through the production of a morning news program called PCAM. PCAM serves as an opportunity for students to participate in a hands-on, immersive experience in the world of video production. In this distinctive program, students learn the basics of broadcasting and studio production, help build connections within the Lower School community, and engage in a daily live show that includes school news and messages consistent with what students are learning in the classroom. Movement classes are designed to help students develop creativity and self-expression through movement, with a focus on coordination, flexibility, gross motor skill development, and teamwork. The movement classes for students in grades one and two emphasize rhythm in music, with students counting beats to follow the steps in a dance and to use creative expression to choreograph their own dances. Students in grades three through give may elect to take ballet during their physical education class period. These dancers participante in an annual ballet performance. During music classes, students gain an understanding of the mechanics of how music works, including music notation, theory, rhythm reading, and sight singing. Orchestra, band, and chorus are offered as electives to Lower School students. Students in these ensembles may attend lessons or rehearsals before or after the instructional day; in lieu of physical education classes; or in place of a general music class. Read more about Fine Arts at Pine Crest. The study of drama in the Lower School is uniquely suited to teaching self-awareness, perspective, and empathy to help students better understand, interact and collaborate with others. In class, students practice the basics of movement and vocal production, pantomime and improvisation, theatre terminology, script elements, technical theater and design, and theatre production. Students in the Lower School may elect to participate in an after-school musical production. The show is a fully-produced musical with staging, dancing, singing, scenery, costumes, lighting, and sound. The Lower School Physical Education program develops students’ locomotor skills by focusing on developmentally appropriate individual and team skills. We implement activities that develop teamwork, collaboration, and leadership skills with an emphasis on the ideals of sportsmanship, such as fairness, respect, and the importance of trying to do one’s best. In grade five, students participate in the Presidential Youth Fitness Program. This program provides educational and motivational tools to promote an active lifestyle. Pine Crest School welcomed authors Brian and Andrea Davis Pinkney to our Boca Raton and Fort Lauderdale campuses recently. Pine Crest School fourth graders visited Kennedy Space Center recently. Pine Crest Lower School student Ellie Weil ’28 was selected as a runner-up in Scholastic Book Club’s “Me and My Hero” national portrait competition.